WASHINGTON -- The United States on February 3 imposed new sanctions against Iran, a move that comes days after Tehran conducted a ballistic-missile test and amid an escalating war of words between the two governments. The U.S. Treasury Department on February 2 added 13 individuals and 12 entities with ties to Iran to its sanctions list, targeting Iranians and at least one Chinese national. Shortly after the announcement, U.S. national security adviser Michael Flynn signaled a new, more confrontational U.S. policy toward Iran, saying the "international community has been too tolerant of Iran's bad behavior." "The days of turning a blind eye to Iran's hostile and belligerent actions toward the United States and the world community are over," he said in a statement. Iran's Foreign Ministry issued a statement the same day denouncing the new sanctions as "not compatible" with U.S. international commitments. The statement added that Iran "will impose legal restrictions on some American individuals and entities that were involved in helping and founding regional terrorist groups" in response. Iran's ILNA news agency quoted Rasoul Dinarvand, head of Iran's Food and Drug Administration, as saying the new provisions that expand the list of restricted medical equipment are "inhumane." A U.S. Treasury Department press release said the sanctions target individuals and entities "involved in procuring technology and/or materials to support Iran's ballistic-missile program" or "acting for or on behalf of, or providing support to, Iran's Islamic Revolutionary Guards Corps-Qods Force (IRGC-QF)." The newly sanctioned entities and companies are based in Lebanon, China, and the United Arab Emirates. Treasury Department official John Smith was quoted as saying Iran's "continued support for terrorism and development of its ballistic-missile program poses a threat to the region, to our partners worldwide, and to the United States." At a White House press briefing, spokesman Sean Spicer said that the sanctions have been in preparation since before U.S. President Donald Trump took office, but that the timing "was clearly in reaction to what we've seen over the last couple days." A senior U.S. administration official told reporters that under Trump, Washington has been conducting a "larger strategic review" of its approach to Iran and that the new sanctions were just "initial steps" in a more confrontational policy. "We have consistently said that we will continue to counter Iran's support for terrorism, destabilizing activities in the region, human-rights abuses, and its ballistic-missile program, including through sanctions where appropriate," the official said. The official stressed, however, that the United States abides by its commitments made under a deal between Tehran and major international powers that restricted Iran's nuclear program in exchange for some sanctions relief. A second senior U.S. administration official told reporters that the sanctioned individuals and entities have "touch points to the United States" that would be affected by the punitive measures. "For example, they procure U.S.-origin goods, or they may have transactions that hit the U.S. financial system. And that would be blocked by this action," the second official said. The move followed stern warnings by the White House earlier this week that Tehran was being "put on notice" over the missile test and other activities. Iran's Defense Minister General Hossein Dehghan on February 1 confirmed that Tehran had conducted a test, but did not say when it occurred or what kind of missile it was. U.S. officials, however, were quoted as saying said it was a medium-range ballistic missile and the test on January 29 ended with a failed re-entry into the atmosphere. The standoff escalated just hours before the new sanctions were made public, when U.S. President Donald Trump warned in a tweet that Iran is "playing with fire." 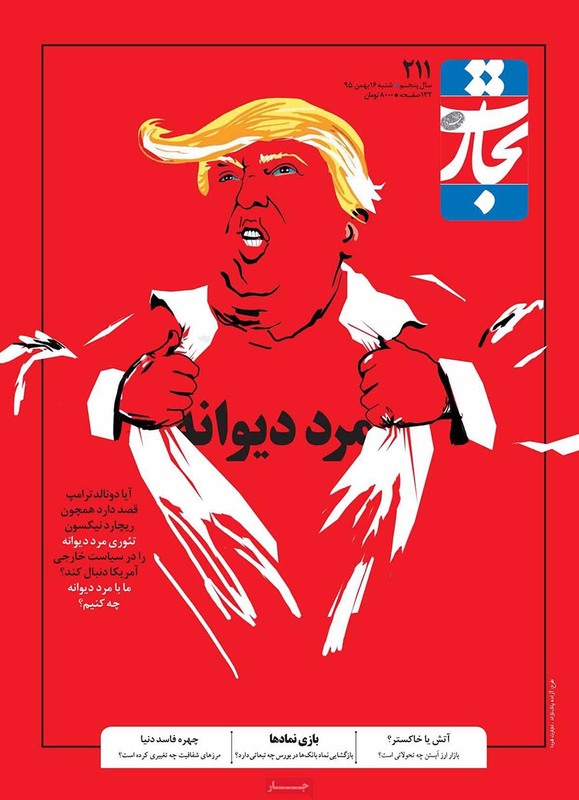 Trump, who has previously vowed to tear up or renegotiate the deal between Iran and major world powers restricting Tehran's nuclear activities in exchange for an easing of sanctions, also tweeted on February 3 that Iran didn't appreciate how "kind" Washington had been. U.S. Representative Ed Royce, chairman of the House Foreign Affairs Committee, lauded the Trump administration for "taking long-overdue steps to hold the regime accountable." "Iran's dangerous and provocative acts are a direct threat to the United States and our allies," the California Republican said in a statement. His Democratic counterpart on the committee, Representative Eliot Engel of New York, also welcomed the new sanctions, saying Washington must continue "to confront Iran's malign activities." In Moscow, Leonid Slutsky, chairman of the International Relations Committee of the Russian State Duma, warned that the new U.S. sanctions "may in the long run be a counterproductive step" that could undermine the Iran nuclear deal. Earlier on February 3, Iran's Foreign Minister Mohammad Javad Zarif downplayed the U.S. "threats" and said Tehran would never initiate war. "Iran [is] unmoved by threats as we derive security from our people. Will never initiate war, but we can only rely on our own means of defense," Zarif wrote on Twitter. Trump campaigned on promises to take a much tougher stance on Iran than his predecessor, Barack Obama, in response to Iranian actions such as threats against Israel and involvement in the conflicts in Syria and Yemen. The first senior administration official told reporters that Washington "will work positively with Iran when [Tehran] abides by its international commitments, while underscoring our commitment to aggressively counter Iran's destabilizing activities, including its support for terrorist and militants groups." The official declined to comment on the U.S. administration's communications with Iran since Trump took office on January 20.